Dogs trained at Dogs4Diabetics will alert their owners when their blood sugar drops. Dogs can be trained to use their sense of smell to recognize illegal drugs and explosives. So Mark Ruefenacht wondered if the animals also could recognize changes in the blood sugar level of people with diabetes. Ruenfenacht has had the disease for much of his life. In 1999, he almost died while training a young dog to be a guide dog for the blind. Without any warning, his blood sugar suddenly dropped to a dangerously low level. Ruefenacht said the dog stayed with him, and tried to keep him awake. "More than likely, I had a seizure, from the low blood sugar. The dog liked me, and he stuck with me and I was able to get my blood sugar up." When talking about a drop in blood sugar, doctors use the term hypoglycemia. Ruefenacht said his near death experience made him wonder if dogs could be trained to identify the chemical changes that happen during an attack, and then inform their owners. Ruefenacht worked with scientists and financed research which found that the "smell" of hypoglycemia appears in both breath and sweat. He also worked with and studied animal trainers who teach dogs to recognize everything from explosives to cancer. In addition, Ruefenacht started training a yellow Labrador retriever named Armstrong to tell him when he had a dangerously low blood sugar level. The training was successful. Armstrong is now listed in The Guinness Book of World Records as the world’s first diabetes-detection dog. Ruefenacht noted that after his early training successes, several organizations offered him a lot of money for the rights to his discoveries. He told VOA he refused those offers. 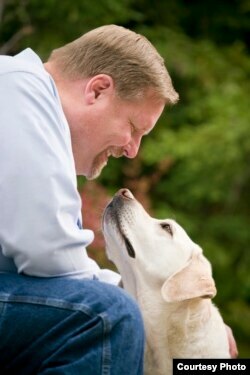 Instead, in 2004, he created a group called Dogs4Diabetics, where he trains dogs to help people with diabetes. Ruefenacht says training for a diabetes detection dog and its owner can cost up to $50,000. His organization raises money to cover the costs, so they can provide dogs for free to those in need. To train the animals, Ruefenacht uses bottles containing swabs of sweat from a diabetic with low blood sugar, and containers of other smells, such as peanut butter, dog food, or plants. The dogs are given a treat when they choose the correct jar. This "sweat jar" method for training diabetes detection dogs has been approved scientifically. The next step is to teach the dog to alert the owner. The dogs are trained to use subtle signs at first. However, if those signals are ignored, the animals then put their paws on the owner’s legs or shoulders. They learn to lick and put their nose in the owner’s face, and make noises. If none of these methods work, the dogs are then trained to find someone else to help. Ruefenacht says the dogs can often detect blood sugar dropping long before electronic systems send a warning sound. Dogs4Diabetics has placed more than 100 dogs with diabetics. The group hopes to expand the program -- training people’s “most loyal friend” to save lives and help diabetics around the world. ShelleySchlender reported this story for VOANews.com. Phil Dierking adapted her story for Learning English. George Grow was the editor. What are other interesting things you have seen dogs trained to detect? Write to us in the Comments Section or on our Facebook page.